Now that Verizon's LTE network has been up and running for a couple of days without incident, it is time to look ahead to the release of the carrier's second 4G handset, the Samsung DROID Charge. Originally expected to be launched on April 28th, the official reason for the delay has not been made public, but priced at $299.99 with a 2 year deal, we're sure that Big Red wanted to make sure that everything on the phone was working perfectly. 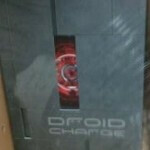 As we reported, a leaked screenshot of a internal memo seemed to forecast a May 3rd launch for the Samsung DROID Charge. 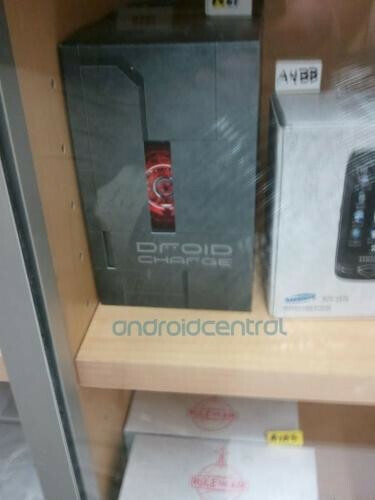 As inventory of the phone moves into place prior to the launch, a Walmart shopper found the phone on a shelf, waiting to be released. While the picture doesn't give us an exact date of launch, it does reveal that a launch is imminent. right there with ya auggie..i was looking forward to selling them last thursday then we find out last minute they can't be sold. kind irritating from a sales and buyers view. I'm just hoping VZW eventually lets the public know what the issue was that prevented the launch. Leave it up to Verizon to have the highest priced, on contract phone. They can keep the 32GB card and price it around $199-$249. Jeez, what's next $349.99? You're paying for exclusivity, nothing more. Not dual core processors, HDMI out, front and rear cameras. It's all about being the first kid on your block with the unit. Are you willing to pay for it? Can you stomach it when 3 months after purchase, you see it listed for a deal on some reseller for $49.99? It's all about hip, now and what's hot and just like fashion - you pay out the yin-yang to be the first one to have it (wear it). That will will hands down be a top phone on vez network. Look at the screen quality of veiwing videos( same as the fascinate) Btw...If you are on the west coast, go to Car toys for your phones. They have a 60 day low price gaured. I paid $200 for my droid x 6months back, litterally 53 days later. They had it for Free after Rebate. They reissued my paperwork and I got a check back Making it free, while it's still$250 at verizon. Car toys rocks!